Jackson Umbarger is a fourth generation co-owner of Roy Umbarger and Sons, Inc. He serves as secretary/treasurer and over sees the day to day operations of company. Jackson provides tremendous energy and enthusiasm for his job that creates a great environment for the employee’s. Jackson has served every role at Umbarger Show Feeds. He started out working for Rusty in the mill while in high school. While in the mill, Jackson made, bagged, and stacked feed. He also helped with the loading of trucks and the delivery of the products to the customers. 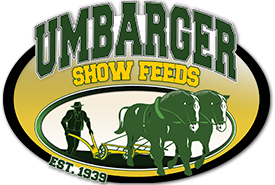 This experience gives him a valuable insight into the day to day operations of Umbarger Show Feeds. Along with overseeing the feed division Jackson has also runs the fertilizer/grain division of Roy Umbarger and Sons, Inc.
Jackson was also a 10 year 4-H member. During his 4-H career Jackson showed swine and even captured Grand Champion barrow at the Johnson Co. Fair. This gives him a great understanding of what livestock projects can do for youth and the importance of the products Umbarger’s are providing. Under his leadership the company has grown to over 10 million in annual sales. Jackson and his wife Carrie reside in Bargersville.